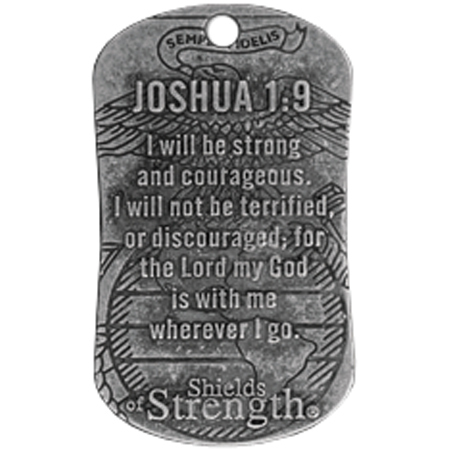 Always have a reminder of strength close to your heart with this USMC Joshua 1:9 Dog Tag and Chain . FRONT READS: U.S. Marines: I will be strong and courageous. I will not be terrified, or discouraged; for the Lord my God is with me wherever I go. BACK READS: Prayer of Salvation: Dear Lord Jesus, I realize I am a sinner, I repent for my sins, and right this moment I receive You as my Lord my Savior. Amen.